"To idly live is to wait for death." It won't be long coming. I give it three pages. Even the first eerie offering foreshadows the doom. 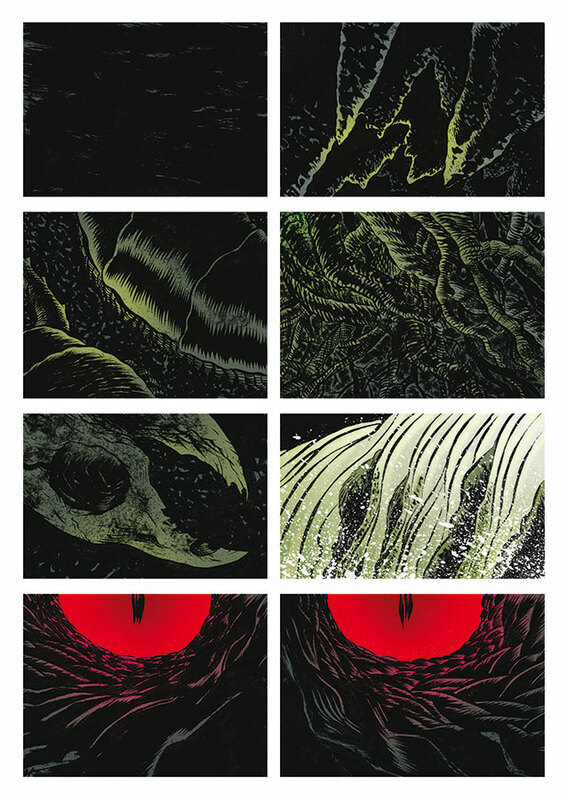 Lit like Charles Burns, an underground river cascades through a bleak, black cavern below jagged stalactites and knotted, invasive roots. Lurking in the darkness, a pair of glowing, inhuman eyes incarnadine the gristly, reptilian, obsidian flesh surrounding them. Something has already had its fill. 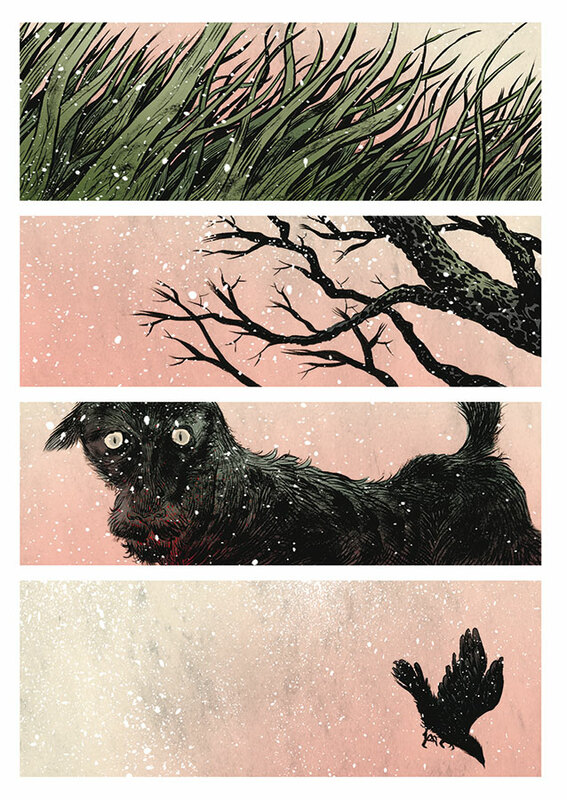 Up above on the snow-swept, pink-dawn plains something hasn't so much raised a dog's hackles as left them buffeted weakly by the wind. A deafening murder of blood-stained carrion crows has formed and is feasting, fighting each other for the most prized pickings: the eyes. There appears to be a lot of carrion. Behind them still stand the fractured remains of the Danes' banqueting hall of Heorot, if only barely. Its broad timbers have been shattered like wooden toothpicks and smeared with blood. "Now I lead the Danes' most glorious era!" 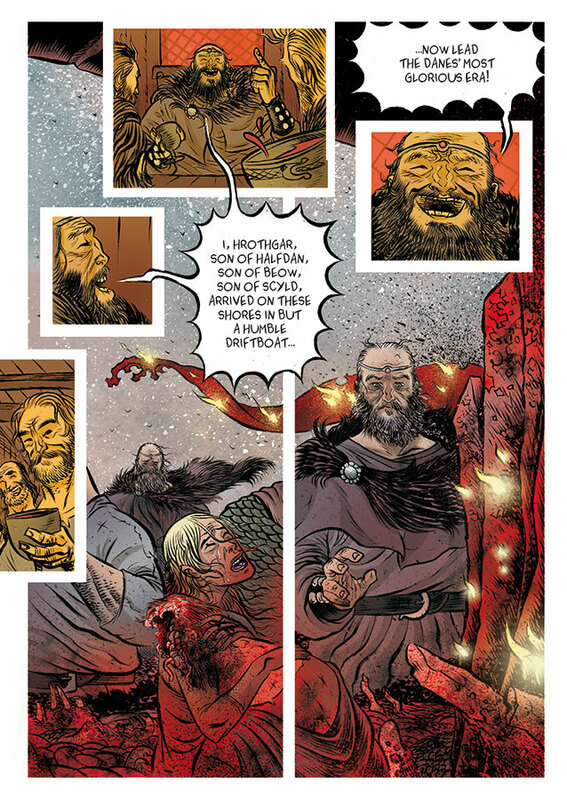 It's very well done: Hrothgar's boastful pride is presented through flashback panels embedded above the very same pages on which he discovers its painfully brutal rebuttal in the form of the corpse-ridden obliteration of the very hall which he hailed at the Danes' greatest glory. It is a perfect piece of juxtaposition, his face falling between past and present as he comprehends his own hubris. "Who dared massacre our own?" he demands, post-pyre, while we're shown a sequence of panels inlaid once more above, showing that self-same, limb-rending massacre with mere glimpses of the intruder: a gigantic arm, eyes and teeth which will prove many and set fast in a crocodilian jaw. 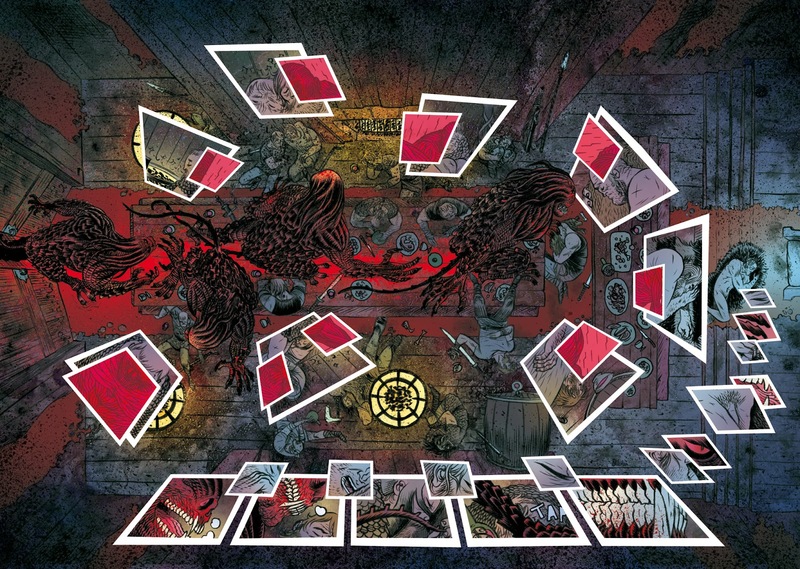 Welcome to a big book of blood, guts and the shredding of sinews. Sinews will feature prominently, as will cleverly inset panels. The first known manuscript of Beowulf - following many centuries of being passed down through the oral tradition - is dated roughly around 1000 AD. Even once written it preserved the importance of the oral tradition for sung stories featured prominently. These were how names were remembered, how histories were celebrated and how eternal glory became a goal far more treasured than mere trinkets. "You've no debt to my kingdom. Why would you come to die so far from all you know?" "Eternal glory, M'lord. After all... gold's spent, life ends. Only glory remains eternal." So speaks Beowulf, more than a decade after Hrothgar commanded his finest warriors to seek out the murderous demon Grendel and exact retribution for the massacre. "May the fury of Danes rain upon the earth." It didn't. They failed. They have since retreated to a fortified town high up an isle like Mont St Michel, only land-bound. 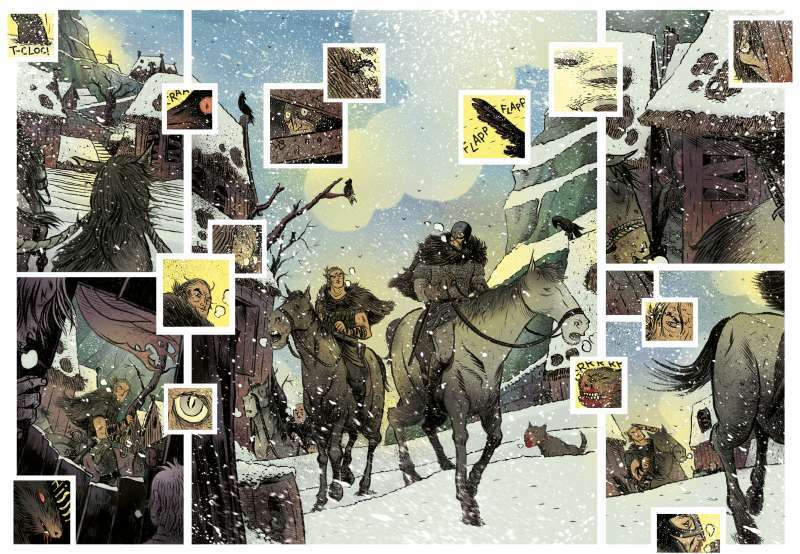 Now Beowulf has learned of this Grendel, has come to slay the beast with his bare hands, and as the stranger leads his men up the steep, icy path through its outskirts more inset panels show their own furtive glances and the reception by bird, beast and man alike. The very finest deployment of these "windows", however, lies within a double-page spread of the Danes' new banqueting hall, glowing red late at night after the warriors have eaten and drunk their fill and lie sleeping on its think-planked, bear wooden floor. It is so tight with tension that I stared at its details for a good half an hour. And there's a lot of subtle detail. At the far right, furthest from the entrance lies Beowulf, naked on fur. The others are clothed but oblivious to the creature who, having ambushed the sentry with its prehensile tail then bitten him in two, has gained entrance. Now, seen from above, Grendel slithers stealthily and unimpeded across the hall in four movements, its freedom to roam emphasised by the absence of vertical panel borders. 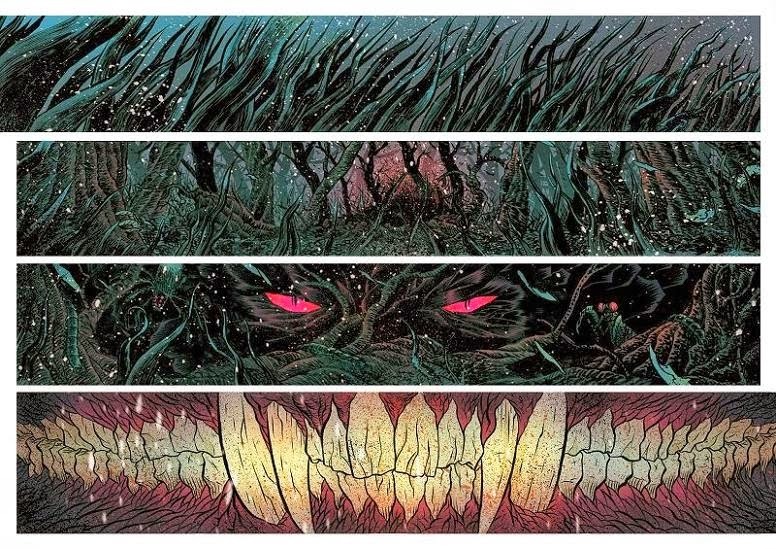 Instead, multiple square panels hung in mid-air like free-floating portraits depict close-ups of the demon's potential victims as its gaze darts left and right, assessing them, sniffing them, its steaming jaws mere inches from their faces. But Garcia and Rubin aren't done, for there is an additional clutch of panels tangential to each of those already inset, all in bright red and revealing the ribbed, skin-peeled muscles underlying their arms, chests and heads. The beast can see through to their actual prowess: let's call it Grendel-vision. That's about as far through the story as I'm prepared to take you, except to say that the next few pages come with a slight surprise which has sent this book straight to one of our top shelves. 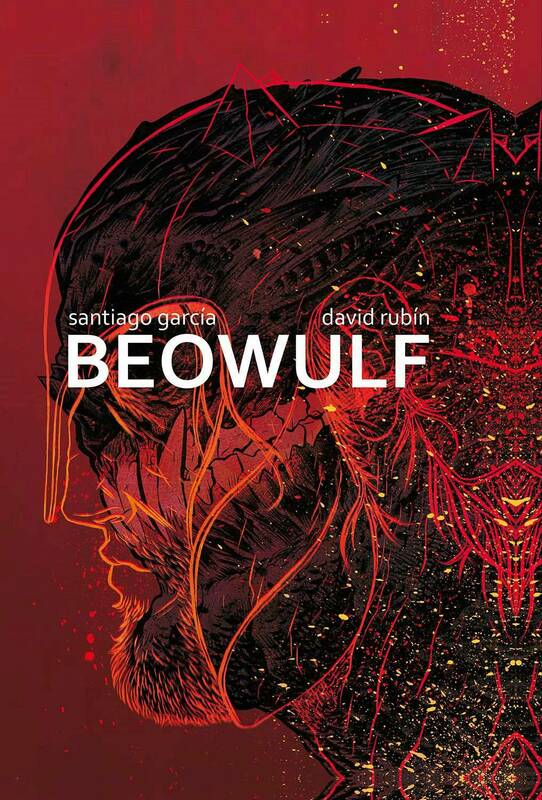 Consider that a Parental Warning for I have known Gareth Hinds' interpretation of BEOWULF (back in stock and on our site in a fortnight - I've found an American edition now that Walker Books have sold out) be bought for the whole family. This gladdens my heart but, if you want to avoid some awkward dinner-table chit-chat, I would probably not be sharing this with your young sons and daughters. I will also add that the title of this book is BEOWULF, not Grendel, and it is much wider in scope that you might initially imagine. 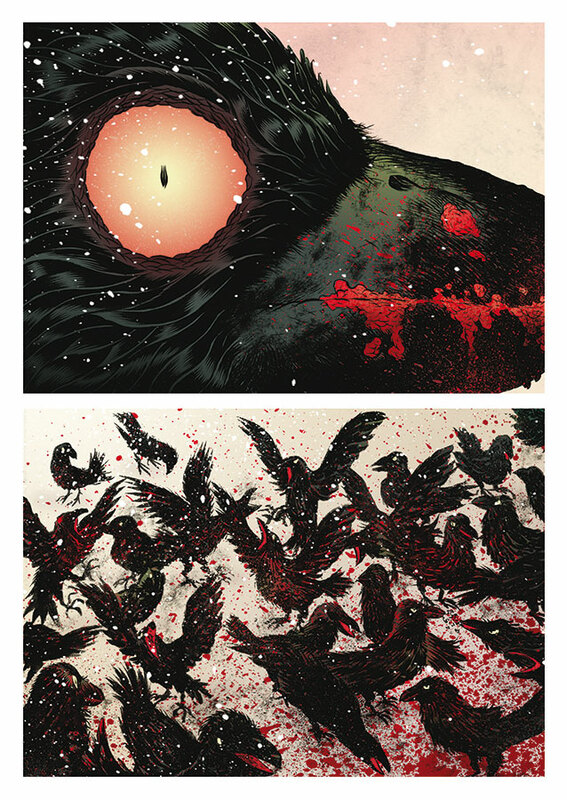 Comparison points for the art come in form of Becky Cloonan, Paul Pope and Rafael Grampa. It's not as faithful in its literary nuances as Gareth Hinds' version but it is absolutely riveting in its own right. There's no real point in replicating others' interpretations, and what I can promise you in lieu of the strictest tradition is visual innovation and jaw-dropping, jaw-splitting spectacle. This is an over-sized book bursting with page after page of visceral, slice-and-dice conflict and gore as the stakes increase exponentially in line with each successive, monstrous adversary so that the pages, however large, can no longer contain the leviathans that lie within. 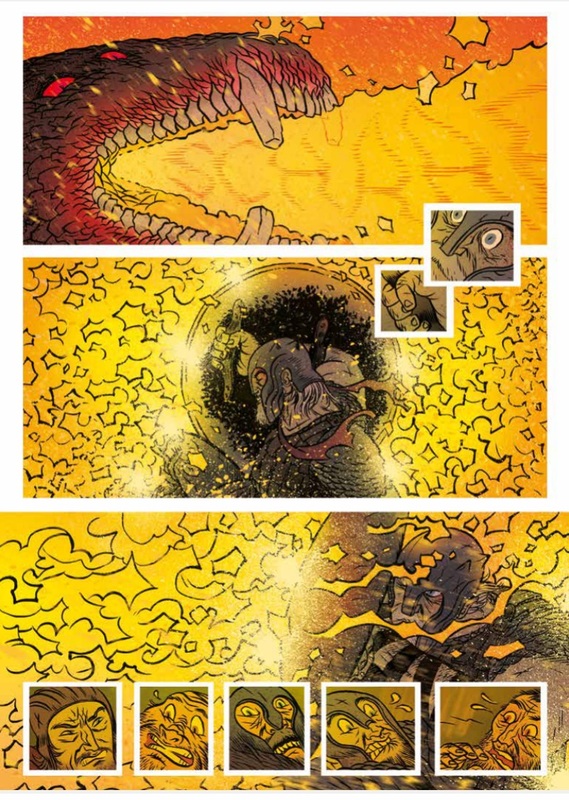 At this point we reference Jack Kirby, Geof Darrow, Michael Oeming et al. None of those are random. But it's not just about the battles. The primal, raw sensuality is maintained by feasts depicting mouths dripping with rare-cooked meat and red-berry juices. And, oh lord, the colouring! I don't think you could make this much more luminous or lambent if you'd lit it on fire: subterranean, glowing greens poisoned by reds and a dragon's breath which appears to fill the air not just with cinders but it's as if every single molecule were a curled piece of combusted paper, blinding and burning your eyes. If that weren't enough, the coup de grace comes in the form of an epilogue so unexpected but also so exceptionally apposite for a tale that's been passed down through so many generations and translated into so many different languages.